Chain pickerel don’t get very big. The world record weighed only 9 pounds, 6 ounces. Average fish in most waters seldom exceed 2. Chains aren’t great table fish, either. Their flesh is sweet and firm, but the fillets are filled with tiny bones, requiring troublesome preparation for the frying pan. Let me tell you why I love pickerel, nevertheless. Picture a winter day with big snowflakes floating down. Not a sound do you hear except the sound of your paddle. Curtains of icicles sparkle along lakeside bluffs. An eagle gazes down as you pass. Wood ducks flush up ahead. The world is virgin white, with scattered beams of color. Cardinal red. Cedar green. Shadow blue. Winter swaddles you in contrasts. Up ahead, a patch of emerald glimmers beneath the crystalline water. You cast a silver spoon beyond it and retrieve, watching the lure flash as it darts over the weed bed. Suddenly, the flashing stops. You react quickly, setting the hook with a snap of the wrist. Fish on! Your rod bends. Then the pickerel goes airborne like a little rocket. Three times it jumps before you land and release it. Another cast, another pickerel, another fun battle—and so on it goes throughout the day. Other fish bite in winter—crappie, saugers, blue cats, walleyes, even bass. But few bite best in winter. Chain pickerel do. They’re like little polar bears. The colder it gets, the more active they become. That’s why I love these little predators. Pickerel add spice to a winter day on the water. They warm me when I’m cold. They give me reason to be outdoors when lakes and streams are quiet, uncrowded and uniquely beautiful. Pickerel range from east Texas north to the Great Lakes and from Maine to Florida, inhabiting a broad spectrum of waters, from small natural lakes and tiny creeks to sprawling man-made impoundments and big-river backwaters. They resemble barracudas. The body is long and slender. Needle-sharp teeth protrude from a prominent duck-billed snout. A dark vertical bar, like a teardrop, extends downward from the eye. Their name derives from the pattern of iridescent green “chains” decorating the fish’s sides. Common nicknames include jack, jackfish, jack pike, green pike, chain pike and chainsides. Weeds in quiet waters are tip-offs to pickerel hotspots. No matter what the season, pickerel usually will be in or near aquatic vegetation in water with little or no current. Plants they favor include coontail, cattails, bulrushes, button willows, elodea, hydrilla and water lilies. Pickerel also have a fondness for dark hollows in cypress and tupelo trees. Hidden in cover, the pickerel lies poised for ambush. When dinner approaches, the predator darts from its lair, gripping the victim with its sharp teeth before turning it head-down and swallowing. The pickerel then swims back to the same hideaway, where it lies motionless until hunger, belligerence or territorial defense urges it out of cover to strike again. 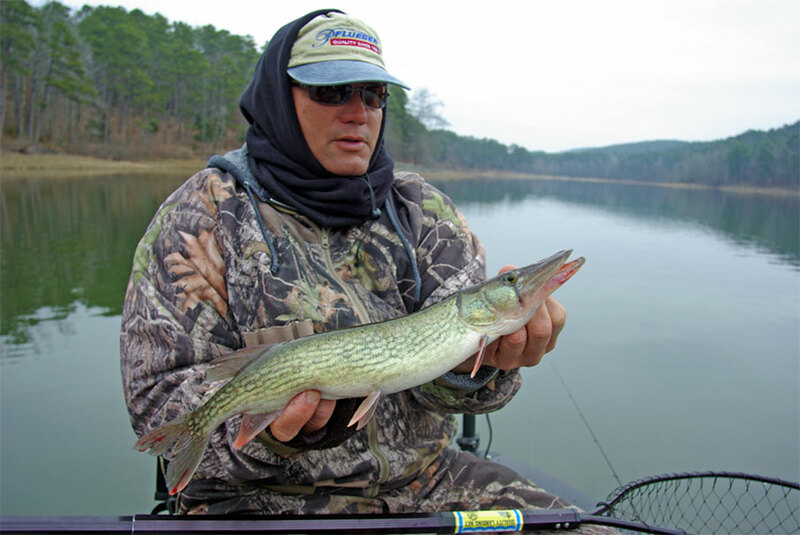 Four- to 6-pound monofilament line on a 5- to 6-foot, medium-action spinning rod is ideal for chain pickerel—light enough so 1- to 2-pounders can strut their stuff, yet strong enough to tame the occasional trophy. Despite pickerel’s sharp teeth, wire leaders rarely are needed. Cut and retie when line gets frayed. The best baits are fish or fish look-alikes. A weedless, silver spoon with a trailing pork rind is an old standard, but small spinners, chugger plugs, slim-minnow lures, jigs, streamers and even plastic worms will elicit strikes. Cast parallel to cover, reeling with a steady, medium-speed retrieve; or, when using topwaters, cast to pockets in weeds, let the lure sit until ripples subside, then twitch the lure again, continuing to the boat with a twitch-and-stop retrieve. Live minnows allowed to swim naturally near cover sometimes take pickerel when artificials fail. Use a size 4 to 1 fine-wire hook, attach a split shot or two a foot above it and add a small bobber. Hook the minnow behind its dorsal fin, then work it in and around weedbeds. Live frogs hooked through a back leg and allowed to swim across weed tops also are first-rate enticements. When thick weeds hinder an angler’s use of more conventional fishing techniques, pickerel can be caught by “skittering.” To do this, you need a 10- to 12-foot cane pole, jig pole or fly rod and an equal length of line. A pork frog or strip of fish belly is affixed to a stout hook, and the bait is jerked, or skittered, across broad openings in weed patches. If pickerel are present, they’ll hit with frenzied, chomping charges. Many prime pickerel waters are largely untapped, so individuals have an excellent chance to attain maximum size, especially in remote waters such as oxbows and bayous. The 9-pound, 6-ounce world record was caught near Homerville, Georgia way back in February 1961. But I’m betting even larger fish are lurking in some seldom-fished waters. If you want to zero in on a trophy, remember these tips. First, big pickerel are inveterate loners found only in prime feeding stations, having driven away weaker competitors. Savvy anglers therefore focus on locales known to yield heavyweight chains. Second, trophy pickerel prefer foods they’re accustomed to eating. Use lures and baits closely resembling the predominant baitfish in the body of water you’re fishing. Third, trophy-class pickerel are reluctant to leave the dark sanctuary of their favored niche. Present your bait in or very near heavy cover and keep it there for the best chance of hooking a muscle-bound brute. I suggest you give pickerel a try this winter. They’re common in many waters, and ounce for ounce, they distinguish themselves in battle as well as any bass. Best of all, they’re eager to strike right now, providing a sure way to knock the chill off a winter day.